This paper reports on synthesis of a magnetic adsorbent for wastewater treatment purposes. In this regard, platanus orientalis waste leaves were chosen as a cheap material for preparing the magnetic adsorbent by loading magnetite nanoparticles on it. The synthesized adsorbent was characterized using scanning electron microscope and X-ray diffractometer. Then, it was used for magnetic solid phase extraction and removal of five cationic dyes including methyl violet (MV), methylene blue (MB), malachite green (MG), crystal violet (CV), and neutral red (NR) from aqueous solution as a model application. Different important factors affecting the adsorption process were optimized, and the results showed that under the optimized conditions (pH 10 for CV, MV, MB, and MG; pH 6 for NR; adsorbent dosage, 20 mg; agitation time, 25 min) efficient removal of the investigated dyes (adsorption capacities between of 89-133 mg g-1) is achievable using the synthesized adsorbent. Furthermore, the reusability experiments showed that the adsorbent could be reused at least ten cycles without any significant loss in its sorption behavior. T. Madrakian, A. Afkhami, M. Ahmadi, H. Bagheri, J. Hazard. Mater. 196 (2011) 109. O. Duman, S. Tunç, T.G. Polat, B.K. Bozoğlan, Carbohydr. Polym. 147 (2016) 79. T. Madrakian, A. Afkhami, N.R. Jalal, M. Ahmadi, Sep. Sci. Technol. 48 (2013) 2638. T. Madrakian, A. Afkhami, H. Mahmood-Kashani, M. Ahmadi, J. Iran. Chem. Soc. 10 (2013) 481. V.K. Gupta, R. Kumar, A. Nayak, T.A. Saleh, M.A. Barakat, Adv. Colloid Interface Sci. 193-194 (2013) 24. W. Peng, H. Li, Y. Liu, S. Song, J. Mol. Liq. 221 (2016) 82. T. Madrakian, A. Afkhami, R. Haryani, M. Ahmadi, RSC Adv. 4 (2014) 44841. A.K. Sarkar, A. Saha, A. Tarafder, A.B. Panda, S. Pal, ACS Sustain. Chem. Eng. 4 (2016) 1679. F.I. Hai, K. Yamamoto, F. Nakajima, K. Fukushi, J. Membr. Sci. 389 (2012) 67. F.I. Hai, K. Yamamoto, F. Nakajima, K. Fukushi, Water Res. 45 (2011) 2199. X. Huang, Y. Zhao, B. Gao, S. Sun, Y. Wang, Q. Li, Q. Yue, J Taiwan Inst. Chem. Eng. 64 (2016) 173. A.K. Verma, R.R. Dash, P. Bhunia, . Environ. Manage. 93 (2012) 154. J. Mittal, V. Thakur, A. Mittal, Ecol. Eng. 60 (2013) 249. H. Shayesteh, A. Rahbar-Kelishami, R. Norouzbeigi, Desalin. Water Treat. 57 (2016) 12822. R. Ahmad, J. Hazard. Mater. 171 (2009) 767. J. Mittal, D. Jhare, H. Vardhan, A. Mittal, Desalin. Water Treat. 52 (2014) 4508. L. Zhang, H. Zhang, W. Guo, Y. Tian, Appl. Clay Sci. 93-94 (2014) 85. R. Kumar, R. Ahmad, Desalination 265 (2011) 112. S. Neupane, S.T. Ramesh, R. Gandhimathi, P.V. Nidheesh, Desalin. Water Treat. 54 (2015) 2041. H. Gan, H. Zhang, J. Cai, H. Jin, K. Zhang, Desalin. Water Treat. 57 (2016) 15241. T. Madrakian, A. Afkhami, M. Ahmadi, Spectrochim. Acta A 99 (2012) 102. M. Peydayesh, A. Rahbar-Kelishami, J. Ind. Eng. Chem. 21 (2015) 1014. 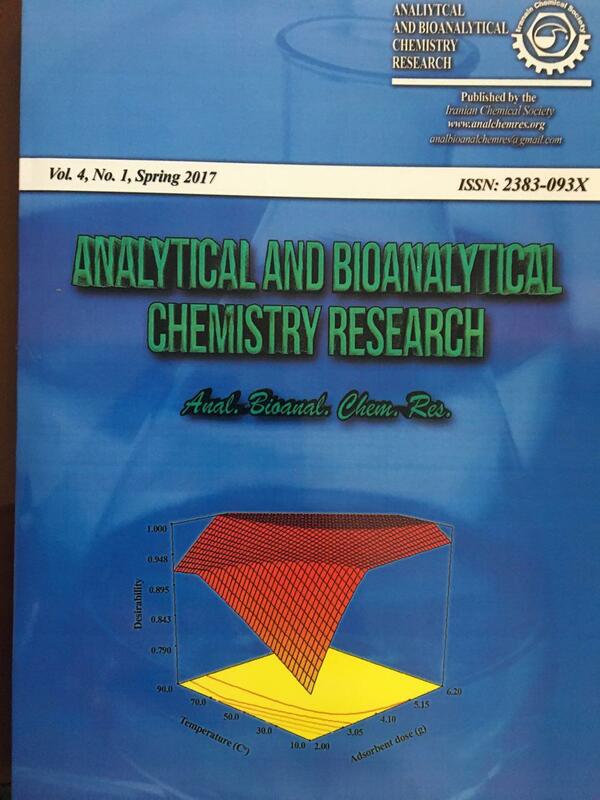 T. Madrakian, M. Ahmadi, A. Afkhami, M. Soleimani, Analyst 138 (2013) 4542. H. Freundlich, W. Heller, J. Am. Chem. Soc. 61 (1939) 2228. I. Langmuir, J. Am. Chem. Soc. 38 (1916) 2221.